Home > Shopping Store > Fruit Salsa Shopping Cart > Mango Salsa-17 oz. 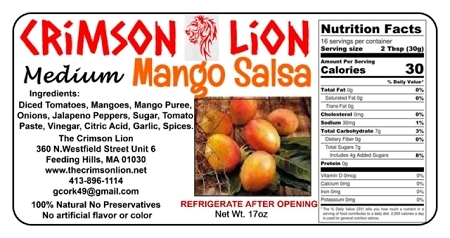 Mango salsa has been a top seller. It continues to be very popular at events and for on line orders. Contains Mangoes, mango puree, diced tomatoes, onions, jalapeno peppers, sugar, tomato paste, vinegar, citric acid, garlic, spices. We are constantly making new Mango salsa trying to keep up with the demand. Mango salsa is a most popular salsa flavor.